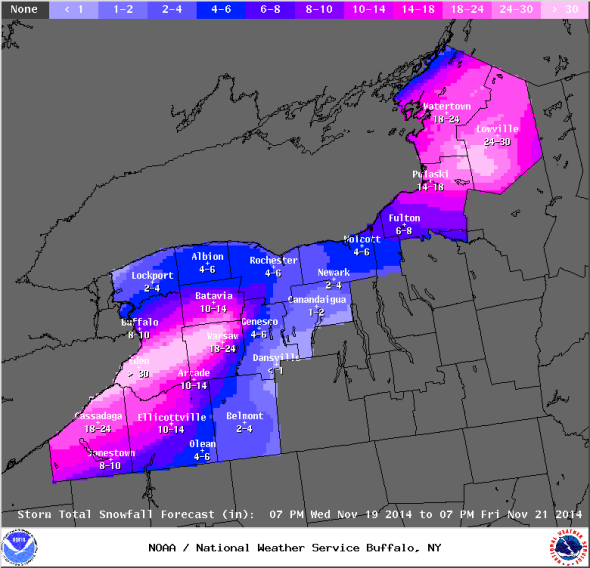 Buffalo snowstorm photos and video: Forecast is for up to 100 inches of snow. 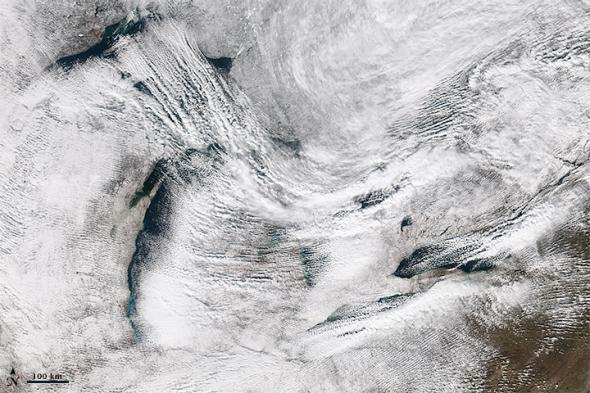 Lake-effect snow streams across the Great Lakes on Tuesday. An encore snowstorm is in progress in the Buffalo area Thursday, just two days after possibly the snowiest 24-hour period on record in the United States produced stunning images from a buried city. 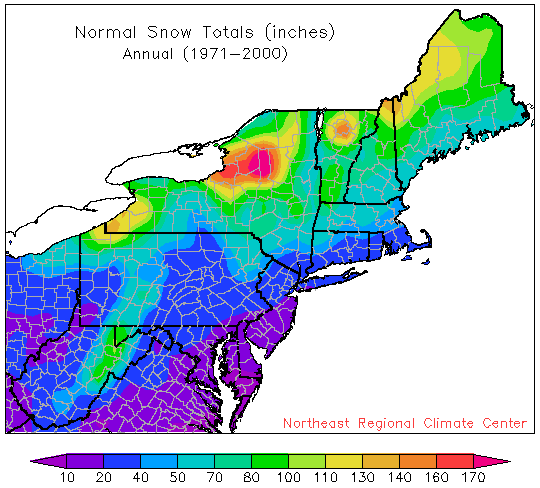 Another 2 or 3 feet are on the way, falling in largely the same area that received a whopping 5 to 6 feet on Tuesday. As was the case earlier this week, the National Weather Service has again maxed out its forecasted snowfall graphic, which simply shows “greater than 30 inches” now expected for the south Buffalo region. Five-day snow totals could approach 100 inches Friday. Truth is, we may never know if the record was broken. According to the Associated Press, some of the regular snow spotters the National Weather Service relies on to take measurements couldn’t get out of their house on Tuesday. For a snow measurement to be official, it must be taken every three hours, with the surface wiped clean in between to prevent compaction. NASA points out that the wind pattern responsible for the current round of lake-effect snows can be traced back to Super Typhoon Nuri’s metamorphosis into a Bering Sea superstorm earlier this month. I reached him by phone in his snow-encased home in West Seneca, New York, to chat about what inspired him to make this video. There’s really nothing else to do, I’m totally hemmed in here. The streets are totally impassable, and we’re getting another 2 feet tonight. We’ve been through this before. It’s a whole lot of snow, but we’re Buffalonians, we can handle it. When storms like this come down, you see little villages up here. You see little communities that come together. Once again, the branch of the National Weather Service typically involved in forecasting severe thunderstorms and tornado outbreaks turned its attention to the potential of thundersnow in New York. Snowfall rates of more than 2 inches an hour are expected for most of the day Thursday. After the shortest of respites, thundersnow is back. Tragically, at least eight people have died so far in the snowstorm, most from shoveling-induced heart attacks. Latest forecasts show the snow may disappear as quickly as it came: A warm-up is on the way this weekend for Buffalo and the rest of the East. With temperatures in the 50s and 60s and rain expected, the streets of Buffalo could quickly turn from winter wonderland to a raging Niagara.